London in the first half of the 18th century was a city addicted to gin. Daniel Defoe noted in 1726 that “the Distillers have found out a way to hit the palate of the Poor, by their new fashion’d compound Waters called Geneva….” Ordinary people, added the writer and trader, “seem not to value the French-brandy as usual, and even not to desire it.” Indeed, around 10 million gallons were being distilled in the Capital each year in the 1730s, before being sold in some 7,000 dram shops. Given that Londoners were estimated to have drunk a staggering 14 gallons of the spirit a year, it wasn’t surprising that the capital suffered from an epidemic of extreme drunkenness. The vice-chamberlain Lord Hervey summed up the problem: “Drunkenness of the common people was universal, the whole town of London swarmed with drunken people from morning till night.” And as I’ve written before, the artist William Hogarth capably captured the impact of the addictive spirit in his popular 1751 print, Gin Lane. In the picture, the poverty and despair of the community was attributed to the evils of gin. The worst of the so-called ‘Gin Craze’ died down within a few decades of the passing of the 1751 Gin Act which permitted distillers to sell only to licensed retailers (there was also an added incentive to get a license as the cost of obtaining these was reduced). Given, however, that people still drink the spirit today (G&Ts are of course very popular) it’s clear it it didn’t completely die out. While I’ve toured working distilleries before (and looked at the outside of surviving 18th century buildings used for performing this function), it seems some have forgotten about the sourcing of essential raw ingredients for this process. Gin could not have been produced without milled grain. Jenever (what Defoe called Geneva) was the Dutch word for juniper, the berries of which were used to produce the lethal spirit which brought debauchery to the streets of London. Shortened to ‘gin’, troops returning from wars in the Netherlands brought the drink to our shores. While it’s been claimed that it was the favourite tipple of William III, the Dutch king of England, it was when it was taken downmarket (following the prohibition of French brandy in 1735) that it made an important imprint in everyday London culture. 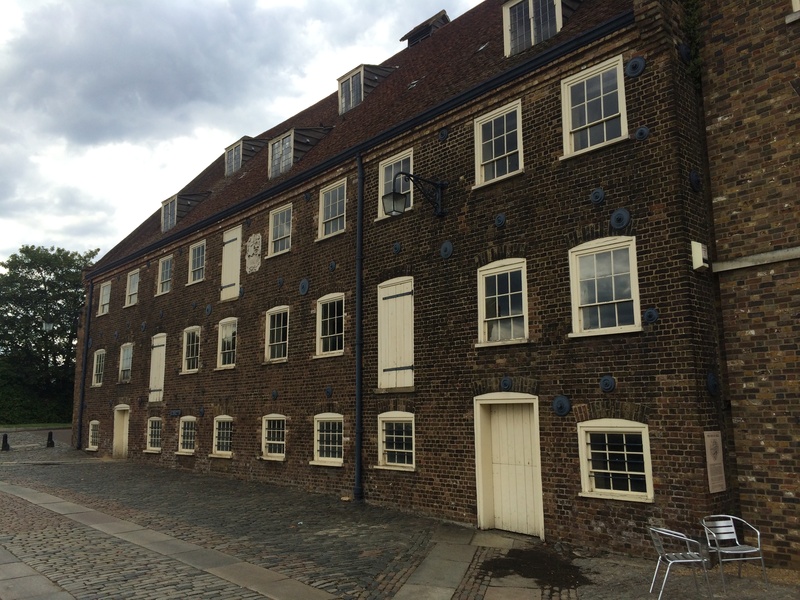 In east London, Peter Lefevre bought Three Mills in 1727 and, in partnership with Daniel Bisson and others established a successful gin distilling business. It was passed down through the generations of some of the owners and they described themselves as “millers and malt distillers in a very large and extensive way.” The operations expanded across this man made island, which had been created by Cistercian monks in the 11th century when a mill was first operated at the site. 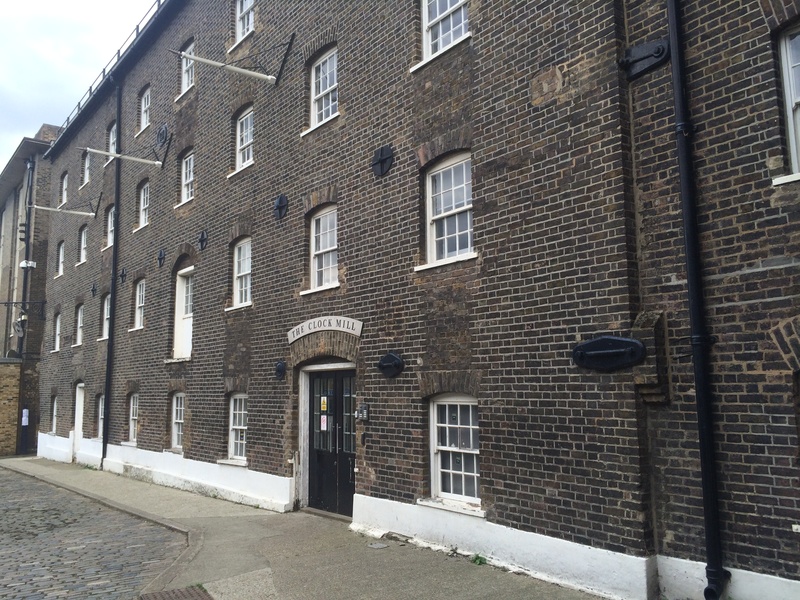 Today, Three Mills can be found at the back of a Tesco car park in Bow in the shadow of both modern apartments and derelict industrial buildings. Although there were certainly mills at the time of the Gin Craze and thus fuelling the distilleries that brought debauchery, the oldest surviving structure is from 1776 (remember that the 1751 Gin Act was the beginning of the end of excessive consumption of the spirit). The House Mill, so-called because it was located between homes of the miller and brewers, is remarkable nonetheless in that it’s the oldest standing tidal mill in the country. Built by Daniel Bisson Senior, the fine Georgian brick façade is deceiving in that it hides a timber frame structure. Today, it is of course no longer an operating mill (it closed for the last time in 1941) but following extensive renovation is now open to the public. Visitors can climb through this building, which retains many original features such as wooden doors, beams and mill stones, and uncover the milling process with a guide. Grain was brought to the mill from farms as far afield as Suffolk by barge or cart (lines of granite slabs denote two-hundred-year-old tramways which are Grade II listed). Sacks would then have been hoisted using water power to the top floor of the building. It was then stored in compartments on the third floor before, thanks to gravity, passing through wooden or canvas shoots to move to the second floor for cleaning. 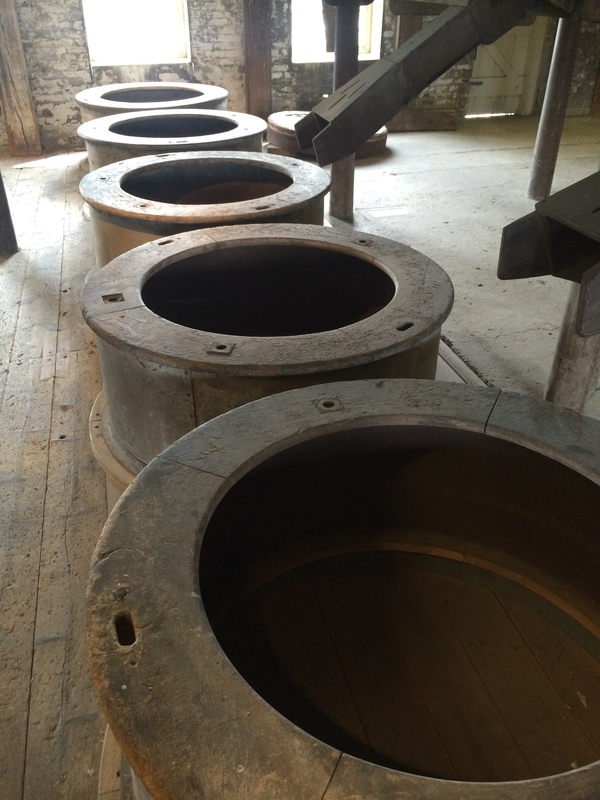 The process then continued as the grain moved to the first floor where it passed through millstones. 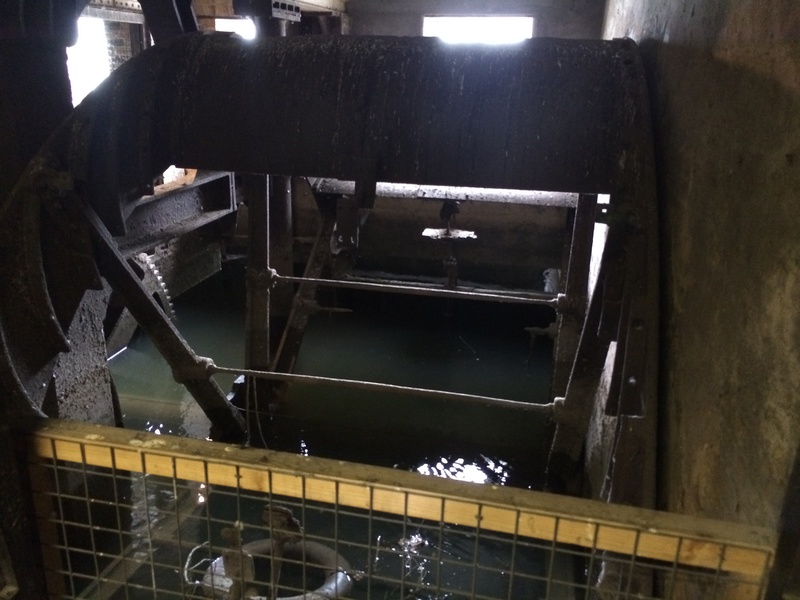 On the ground floor, hidden away behind large wooden doors, are the water wheels which were powered by the tide going out. Water stored at high tide could be released when the tide was low, providing a constant power through the day. 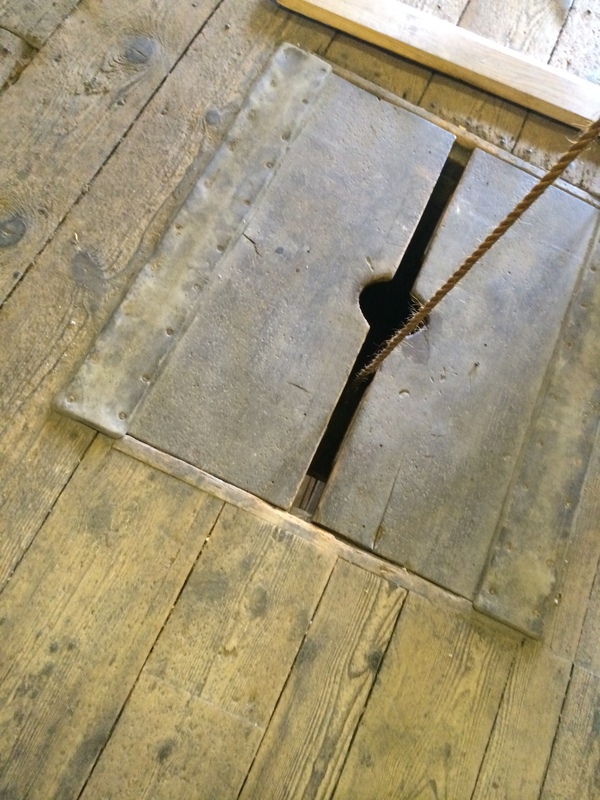 It was on this level that ground grain fell it to sacks, ready for transportation to the distillery. The whole House Mill operation employed 15 people on each shift. What’s remarkable is the history on the site goes back much further than the 18th century. The Domesday Survey of 1086 notes there were eight tidal watermills (“eight Mills of Hame” – Hame being the name then for Newham) on the River Lea and branches. These were identified by names such as Pudding Mill, Waterworks Mill and, of course, Three Mills which was set-up by the Cistercian monks from the nearby Abbey of St. Mary Stratford Langthorne (today near Abbey Road DLR stop and near where remains of the monastery have been found). Following a move by Edward III to expand commercial operations in the 14th century in the River Lea area and the subsequent passing of a 1571 Act to improve navigation, by 1588 there were said to be two water mills on the Three Mills island. Expansion continued at the site, with the Clock Mill rebuilt in 1817 (but retaining a 1750s clock tower) replacing a timber-built, weather-boarded mill. The building (which ceased to function as a mill in 1952) survives but is no longer open to the public – it forms part of the 20-acre 3 Mills film and television studios development. There was also once a third mill – a windmill – on the site which survived until around 1840. The home on the left of House Mill was completely wiped out by a bomb during the Second World War. The building on the right (once the miller’s house) was also badly damaged and only the façade remained; the visitors’ centre with a fine outside riverside terrace overlooking an expanse of green space is completely new and boasts a friendly café run by volunteers. Rooms in this modern structure are also let out to community groups providing valuable finances for the River Lea Tidal Mill trust which owns the site. Renovation work continues at House Mill with the intension that one day the original 18th century water wheels will be turning again and visitors can be provided with milling demonstrations. But perhaps the most exciting aspect is that they will be used to generate hydro-electricity and sold to the National Grid, potentially generating £20,000 in funds for the charity each year. The old and the new are creating a bright future for east London while at the same time helping to preserve our rich industrial past.